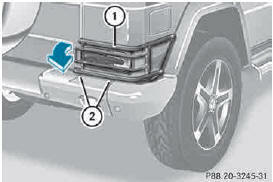 You must remove the protective grille before you can change the bulbs in the tail lamps. ► Swing protection grille 1 to the right. 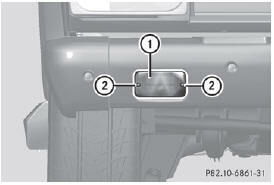 ► After changing the bulbs, swing protection grille 1 to the left. 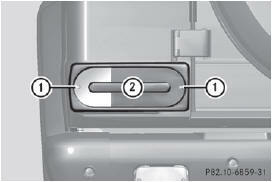 When installing the lens, make sure that the seal is positioned correctly. ► Turn the bulb counterclockwise, applying slight pressure, and remove it from bulb holder. ► AMG vehicles: secure the protection grille . 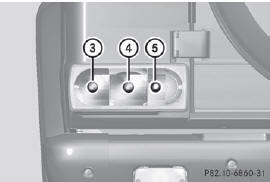 ► Turn bulb 3 counter-clockwise, applying slight pressure, and remove it from the bulb holder. 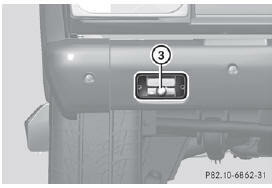 ► Replace and tighten screws 2.